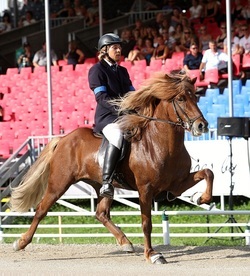 Roope started competing on six years old, 2007. That year he came finnish champion in tölt ( 7.33 ) and fourgait combination. Since then he has been unbeatable in all tölt competitions in Finland. He is Finnish champion in tölt and fourgait combination, 2007, 2008, 2009, 2010 and 2011. His best result is 7.77 in tölt. Best result so far is 8th position in WM Austria 2011. 2013 he started his season well. 3rd place in Worldtoelt T.1. Finnish champion once again 2013 with a score of 7.83.